High School Sweethearts Daniel L. Crocker and Brenda Lynch graduated from Selma High School in Johnson County, NC. Following their marriage in 1965, Dan earned his BS degree in Premed from Davidson College and Brenda earned her BS in Elementary Education from East Carolina University. Dan went on to graduate first in his class from North Carolina School of Medicine as Medical Doctor and to complete Residencies at Parkland Memorial Hospital in Dallas, TX and at the NC Memorial Hospital in Chapel Hill. From 1973 to 75 he was a Research & Clinical Fellow in Hematology at the University of NC. Brenda taught school & supported Dan wherever his training took them! 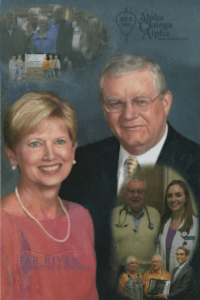 In 1975 Dan & Brenda moved to Rocky Mount when he joined Boice-Willis Clinic where, for 25 years, he endeared himself to his patients and their families. In 1975 he founded the Eastern N.C. Medical Group, serving as its President and then as Manager, a position he still holds. Meanwhile, Brenda founded the first 2-year preschool in Rocky Mount at West Haven Presbyterian where she taught for 20 years and served as Director for 12 years. She also served the Girl Scouts as troop leader, Scout Chairman and President of the 26-counnty Coastal Carolina Girl Scouts. In 1986 the Crockers, both music lovers & both musically-talented, successfully undertook creation of the Tar River Choral and Orchestral Society. From one ensemble it has grown to six, including a Philharmonic Orchestra, a Symphonic Band, an Adult Chorus and the Children’s Chorus & Youth Strings. Dan has served as its President for 30 years. Brenda served as Orchestra Manager for 12 years and continues on its Board of Directors. For the last four years, she has served as President of the Tar River Orchestra and Chorus League, the support and fund-raising arm of the parent organization. Brenda served as President of the RM Garden Club for 4 years and in leadership positions of increasing responsibility with the NC Garden Club. NC Wesleyan College recently honored Dan and Brenda with the Algernon Signey Sulllivan Award for their outstanding service including: Co-Chairing the 1987 Day for Wesleyan Campaign, serving on the Board of Distinguished Visitors and the Board of Directors They have also created Scholarships, mentored students and, using Brenda’s gardening talent, helped beautified the campus! Dan & Brenda are extremely active members of West Haven Presbyterian Church. They have two daughters and 3 grandsons.